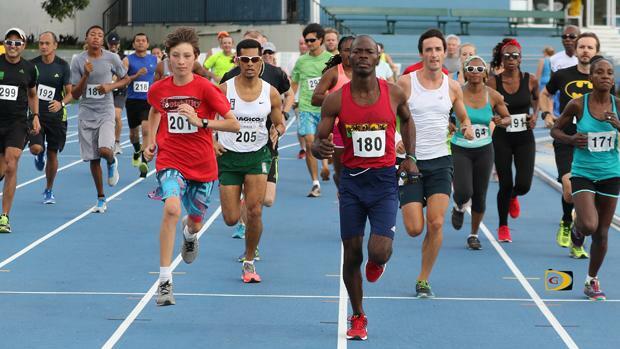 TORTOLA-Melissa Brunner and Reuben Stoby closed the Blenheim Trust 5K Series with victories on Saturday. The race started and ended at the A. O. Shirley Grounds. "It felt amazing and it was a personal record," Brunner said of her 22 minutes and 10 seconds run. "The training was pretty hard all season and I think the big race in Virgin Gorda last weekend just sort of primed me up for this one. But I was quite shocked when I passed Rose (Johnson) I thought for sure she was going to be on my tail right at the end. Took a few looks back coming down the home stretch and she wasn't there so I sprinted the last bit just to get my personal best, so I worked out. So, I'm quite pleased." Stoby led the field of 41 participants in 18:42 and said he wanted to run sub 17:00. "There was a strong headwind, but definitely after the first mile, I realized Virgin Gorda (Half Marathon) was still in my legs, so I just decided not to push it any harder. And then I was missing Vincent (Fournier). Maye if he was here, he would have been able to pull me through." Stoby said he was happy to come out on top to end a tough season where he had his wins and losses. "It's always good to end on a winning note and I look forward to what's to come in the 10K Series," he said. "It was a good race. The conditions were a bit hot and the sun was out, but I was able to push it through and win fairly easily in the end." Final Results: Men. 1. Reuben Stoby, 18 minutes and 42.1 seconds. 2. Julius Farley, 19:11.3. 3. Guy Williamson, 19:43.5. 4. Derek Pettigrew, 20:27.2. 5. Zebalon Mclean, 21:41.5. 6. Adrian Dale, 21:47.1. 7. Guyp Dubois, 21:58.7. 8. Ishwar Persad, 22:09.1. 9. Richard Morgan, 23:11.9. 10. Charles Kerins, 23:33.0. 11. David Pettigrew, 23:48.2. 12. Reu Rhymer, 24:02.3. 13. Viv Paverd, 24:11.7. 14. Claudius Rhymer, 24:38.6. 15. Dennis Versoza, 25:39.0. 16. Dennis Delacruz, 25:53.3. 17. Ruairi Bourke, 27:26.9. 18. Shane Donovan & family, 27:34.7. 19. Laurent Keeble-Buckle, 28:14.1. 20. Chris Conway, 30:35.9. 21. Howard Moore, 30:45.9. 22. Ravenol Santos, 34:54.4. 23. Barry Leon, 36:34.8. 24. Gabriel Obregon, 47:47.9. Women: 1. Melissa Brunner, 22:10.0. 2. Rosmond Johnson, 22:55.1. 3. Juliane Potgieter, 23:15.2. 4. Saungie Liburd, 24:03.2. 5. Lauren Julien, 24:09.3. 6. Gillian Plaxton, 24:48.5. 7. Philomena 'Robertson, 25:59.2. 8. Anna Kinkead, 25:59.8. 9. Kay Reddy, 26:08.1. 10. Rhiannon Jones, 26:52.3. 11. Cayley Smit, 27:44.5. 12. Natasha Ruscheinski, 29:14.3. 13. Clair Burke, 30:26.8. 14. Nedy Ador Dionicio, 31:07.1. 15. Roslyn Gilbert, 31:56.4. Youth 1 MILE: Boys. 1. Sammy Potgieter, 6:43.44. 2. Charlie Potgieter, 8:29. 3. Sebbie Morgan, 10.02. Girls: 1. Z'Hara McLean 10:04. 800M: 1. James Tucker, 4:11. 2. Xavier Morgan 4:14.